"The Jewish question" redirects here. For the 1843 book, see The Jewish Question. For other uses, see Jewish question (disambiguation). The "Jewish question", also referred to as the "Jewish problem", was a wide-ranging debate in 19th- and 20th-century European society that pertained to the appropriate status and treatment of Jews. The debate which was similar to other so-called "national questions," dealt with the civil, legal, national and political status of Jews as a minority within society, particularly in Europe during the 18th, 19th and 20th centuries. The debate was started within western and central European societies by politicians and writers who were influenced by the Age of Enlightenment and the ideals of the French Revolution. The debate's issues included the legal and economic Jewish disabilities (e.g. Jewish quotas and segregation), Jewish assimilation, Jewish emancipation and Jewish Enlightenment. The expression has been used by antisemitic movements from the 1880s onwards, culminating in the Nazi phrase "the Final Solution to the Jewish Question". Similarly, the expression was used by proponents for and opponents of the establishment of an autonomous Jewish homeland or a sovereign Jewish state. 1 History of "The Jewish question"
History of "The Jewish question"
The term "Jewish question" was first used in Great Britain around 1750 when the expression "Jewish question" was used during the debates related to the Jew Bill of 1753. According to Holocaust scholar Lucy Dawidowicz, the term "Jewish Question," as introduced in western Europe, was a neutral expression for the negative attitude toward the apparent and persistent singularity of the Jews as a people against the background of the rising political nationalisms and new nation-states. Dawidowicz writes that "the histories of Jewish emancipation and of European antisemitism are replete with proffered 'solutions to the Jewish question.'" The question was next discussed in France (la question juive) after the French Revolution in 1789. It was discussed in Germany in 1843 via Bruno Bauer's treatise Die Judenfrage ("The Jewish Question"). He argued that Jews could achieve political emancipation only if they let go their religious consciousness, as he proposed that political emancipation required a secular state. In 1898, Theodore Herzl's treatise, Der Judenstaat, advocates Zionism as a "modern solution for the Jewish question" by creating an independent Jewish state, preferably in Palestine. According to Otto Dov Kulka of Hebrew University, the term became widespread in the nineteenth century when it was used in discussions about Jewish emancipation in Germany (Judenfrage). In the 19th century hundreds of tractates, pamphlets, newspaper articles and books were written on the subject, with many offering such solutions as resettlement, deportation, or assimilation of the Jewish population. Similarly, hundreds of works were written opposing these solutions and offering instead solutions such as re-integration and education. This debate however, could not decide whether the problem of the Jewish Question had more to do with the problems posed by the German Jews' opponents or vice versa: the problem posed by the existence of the German Jews to their opponents. From around 1860, the term was used with an increasingly antisemitic tendency: Jews were described under this term as a stumbling block to the identity and cohesion of the German nation and as enemies within the Germans' own country. Antisemites such as Wilhelm Marr, Karl Eugen Dühring, Theodor Fritsch, Houston Stewart Chamberlain, Paul de Lagarde and others declared it a racial problem insoluble through integration. They stressed this in order to strengthen their demands to "de-jewify" the press, education, culture, state and economy. They also proposed to condemn inter-marriage between Jews and non-Jews. They used this term to oust the Jews from their supposedly socially dominant positions. The most infamous use of this expression was by the Nazis in the early- and mid- twentieth century. They implemented what they called their "Final Solution to the Jewish question" through the Holocaust during World War II, when they attempted to exterminate Jews in Europe. In his book The Jewish Question (1843), Bauer argued that Jews could only achieve political emancipation if they relinquish their particular religious consciousness. He believed that political emancipation requires a secular state, and said that did not leave any "space" for social identities such as religion. According to Bauer, such religious demands are incompatible with the idea of the "Rights of Man." True political emancipation, for Bauer, requires the abolition of religion. Karl Marx replied to Bauer in his 1844 essay On the Jewish Question. Marx contradicted Bauer's view that the nature of the Jewish religion prevented assimilation by Jewish people. Instead he focused on the specific social and economic role of the Jewish group in Europe which, according to him, was lost when capitalism, the material basis for Judaism, assimilated the European societies as a whole. Marx uses Bauer's essay as an occasion for his own analysis of liberal rights. Marx argues that Bauer is mistaken in his assumption that in a "secular state", religion will no longer play a prominent role in social life. As an example, he refers to the pervasiveness of religion in the United States, which, unlike Prussia, had no state religion. In Marx's analysis, the "secular state" is not opposed to religion, but rather requires it. The removal of religious or property qualifications for citizens does not mean the abolition of religion or property, but only introduces a way of regarding individuals in abstraction from them. On this note Marx moves beyond the question of religious freedom to his real concern with Bauer's analysis of "political emancipation." Marx concludes that while individuals can be 'spiritually' and 'politically' free in a secular state, they can still be bound to material constraints on freedom by economic inequality, an assumption that would later form the basis of his critiques of capitalism. 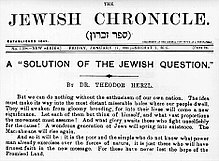 The Jewish Chronicle promoting Herzl's Judenstaat as "a 'solution of the Jewish question.'" Werner Sombart praised Jews for their capitalism and presented the seventeenth–eighteenth century court Jews as integrated and a model for integration. By the turn of the twentieth century, the debate was still widely discussed. The Dreyfus Affair in France, believed to be evidence of anti-semitism, increased the prominence of this issue. Within the religious and political elite, some continued to favor assimilation and political engagement in Europe while others, such as Theodore Herzl, proposed the advancement of a separate Jewish state and the Zionist cause. Between 1880 and 1920, millions of Jews created their own solution for the pogroms of eastern Europe by emigration to other places, primarily the United States and western Europe. In Nazi Germany, the term Jewish Question (in German: Judenfrage) referred to the belief that the existence of Jews in Germany posed a problem for the state. In 1933 two Nazi theorists, Johann von Leers and Achim Gercke, both proposed the idea that the Jewish Question could be solved by resettling Jews in Madagascar or resettling them somewhere else in Africa or South America. They also discussed the pros and cons of supporting the German Zionists. Von Leers asserted that establishing a Jewish homeland in British Palestine would create humanitarian and political problems for the region. Upon achieving power in 1933, Adolf Hitler and the Nazi state began to implement increasingly severe measures that were aimed at segregating and ultimately removing the Jewish people from Germany and (eventually) all of Europe. The next stage was the persecution of the Jews and the stripping of their citizenship through the Nuremberg Laws. Later, during World War II, it became state-sponsored internment in concentration camps. Finally the government implemented the systematic extermination of the Jewish people (The Holocaust), which took place as the so-called Final Solution to the Jewish Question. Nazi propaganda was produced in order to manipulate the public, the most notable examples of which were based on the writings of people such as Eugen Fischer, Fritz Lenz and Erwin Baur in Foundations of Human Heredity Teaching and Racial Hygiene. The work Die Freigabe der Vernichtung lebensunwerten Lebens (Allowing the Destruction of Life Unworthy of Living) by Karl Binding and Alfred Hoche and the pseudo-scholarship that was promoted by Gerhard Kittel also played a role. In occupied France, the collaborationist regime established its own Institute for studying the Jewish Questions. A dominant anti-Semitic conspiracy theory is the belief that Jewish people have undue influence over the media, banking and politics. Based on this conspiracy theory, certain groups and activists discuss the "Jewish Question" and offer different proposals to "address" it. In the early 21st century, white nationalists, alt-righters, and neo-Nazis have used the initialism JQ in order to refer to the Jewish question. ^ a b "Essay based on the introduction to The 'Jewish Question' in German Speaking Countries, 1848–1914, A Bibliography, in The Felix Posen Bibliographic Project on Antisemitism (Jerusalem: Hebrew University, 1994); retrieved 25 March 2008". Archived from the original on 25 November 2005. ^ Lucy Dawidowicz, The War Against the Jews, 1933–1945 (New York, 1975), pp. xxi–xxiii. ^ Herzl, Theodor (1988) . "Biography, by Alex Bein". Der Judenstaat [The Jewish state]. transl. Sylvie d'Avigdor (republication ed.). New York: Courier Dover. p. 40. ISBN 978-0-486-25849-2. Retrieved 28 September 2010. ^ As of 2008 Otto Dov Kulka's works are out of print, but the following may be useful and is available on microfilm: Reminiscences of Otto Dov Kulka (Glen Rock, New Jersey: Microfilming Corp. of America, 1975), ISBN 0-88455-598-4 and 9780884555988, OCLC 5326379. ^ a b Stig Hornshoj-Moller (24 October 1998). "Hitler's speech to the Reichstag of January 30, 1939". The Holocaust History Project. Archived from the original on 14 March 2008. Retrieved 25 March 2008. ^ Karl Marx (February 1844). "On the Jewish Question". Deutsch-Französische Jahrbücher. Retrieved 25 March 2008. ^ Werner Sombart (1911) [translated in 2001]. The Jews and Modern Capitalism (PDF). Batoche Books. Retrieved 25 March 2008. ^ Theodor Herzl (1896). Der Judenstaat: Versuch einer modernen Lösung der Judenfrage (in German). M. Breitenstein's Verlags-Buchhandlung. Retrieved 25 March 2008. ^ Dr. Achim Gercke. "Solving the Jewish Question". ^ Adolf Hitler; Wilhelm Frick; Franz Gürtner; Rudolf Hess (15 September 1935). "Nuremberg Law for the Protection of German Blood and German Honor". Archived from the original on 19 March 2008. Retrieved 25 March 2008. ^ Adolf Hitler; Wilhelm Frick (15 September 1935). "Reich Citizenship Law". Archived from the original on 21 March 2008. Retrieved 25 March 2008. ^ Doris Bergen (2004–2005). "Germany and the Camp System". Auschwitz: Inside the Nazi State. Community Television of Southern California. Retrieved 25 March 2008. ^ Niewyk, Donald L. The Columbia Guide to the Holocaust, Columbia University Press, 2000, p.45: "The Holocaust is commonly defined as the murder of more than 5,000,000 Jews by the Germans in World War II." Also see "The Holocaust," Encyclopædia Britannica, 2007: "the systematic state-sponsored killing of six million Jewish men, women and children, and millions of others, by Nazi Germany and its collaborators during World War II. The Germans called this "the final solution to the Jewish question." ^ Gord McFee (2 January 1999). "When did Hitler decide on the Final Solution?". The Holocaust History Project. Archived from the original on 2 June 2015. Retrieved 25 March 2008. ^ Kestenbaum, Sam. "White Nationalists Create New Shorthand for the 'Jewish Question'". The Forward. Retrieved 25 May 2017.